MNML series rice milling machine is designed for milling the coarse rice to the white rice with clean and shine luster, which is adopted the advance international technology standard to engineer into an innovative vertical machine. This rice milling machine is not only suitable for indica rice and parboiled rice, but also widely applied in rice milling production line and rice processing line with the evenly and uniformly grinding white effect. 1. No need to equip withthe hoister, can accomplish the even conveying effect due to material flow spirals from down to up into the whitening chamber. 2. Integrates grinding action and frictional action to achieve muti-functional usage. 3. High pression draught fan equipped into the body internal are connected with the suction pipe which can research much stronger discharging chaff powder effect and low the whitening rice in most degree. 4. Fluidized rice milling device makes rice grinding milling more gently to reduce the broken rice rate and improve the white rice productivity. 5. Parts and components are durable for longer service and reliable performance with less maintenance. 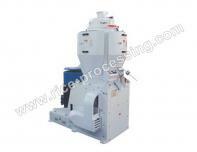 Our company is specialized exporter, manufacturer and supplier of MNML Series Rice Milling Machine in 中国.